Our 8th Annual Public Meeting attracted a good audience, including local politicians. This year we had three guest speakers as well as presentations from OFA on matters concerning local areas. John Copley and Barry Russell were made OFA Flood Stars. 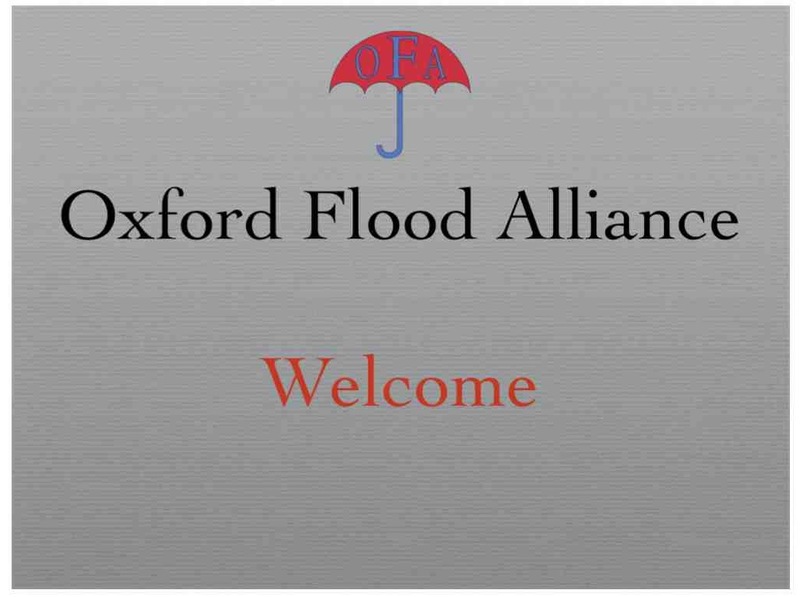 John has expertly chaired the Oxford Area Flood Partnership since its inception in 2007. Working behind the scenes, he and the partnership have achieved a very great deal in this time. Meanwhile, a well known presence in his waders in every recent flood, Barry, from the Environment Agency, is a key figure in managing flooding on the ground. He has also been involved in many of the flood prevention measures taken here in recent years. We are immensely grateful to them both for all they have done, all the hard work and long hours put in. They have made a real difference. Ben Ward spoke about Oxford Flood Network’s plans to install water level monitors in the Oxford area to provide live information on water levels, to a computer or smartphone, during flooding, on a much more local scale than at present available. This is an exciting prospect and we welcome it. Ben is looking for people who are prepared to have a (compact) sensor device sited, say, in their garden, or other suitable location. Nick Ross and Matthew Rose presented Thames Water’s plans for a three-year comprehensive survey (already just begun) of main sewers throughout the Oxford area. This is very welcome as there have been many serious problems with foul sewer overflow, especially during floods. Richard Harding and Barry Russell of the Environment Agency explained the Oxford Flood Alleviation Scheme. This c. £125 million scheme is intended to reduce the risk of flooding in Oxford to once in 75 years (though some areas may still be affected more often) – assuming that climate change does not conspire to make things worse (as it well may). A lively discussion ensued, which will no doubt be continued elsewhere. Thank you to everybody who came and for the generous donations to support our work. OAFP annual public meeting this evening at which Thames Water announced news of a £1million+ study of the Oxford area catchment sewers, over the next 2-3 years. This will result in a business plan to take appropriate action. That will then have to be funded. Welcome news, well done all who have worked towards this, not least Oxford City Council and local MPs, but most of all to Thames Water themselves. An interesting meeting, and well attended, but we missed the open floor question session that disappeared last year; hope it’ll be back next year.